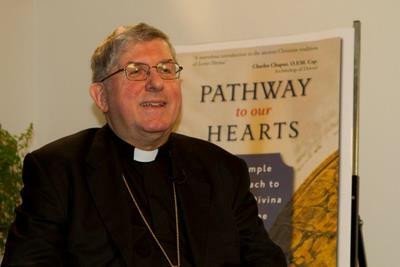 Last Friday afternoon, I arrived at the 5th floor, resource Library of the Catholic Pastoral Centre in Toronto for a special book signing of Archbishop Thomas Collins’ new book, Pathway to our Hearts: A Simple Approach to Lectio Divina with the Sermon on the Mount. As many of you know, Archbishop Collins is a great fan of the tradition of praying with Scriptures. Lectio divina literally means sacred reading and in this book, Collins shares an accessible approach to and a fresh perspective on this ancient practice. Compiled from the transcripts of his first lectio series at St. Michael’s Cathedral, from 2007, the book invites readers to listen to the Word of God and ask what this word tells them about loving God with their mind, their heart and with their hands. The book is for anyone who wants to pray with the Word of God and develop a closer relationship with Jesus Christ. If you’ve been present at any of Archbishop Collins’ public lectio sessions, either in Edmonton or Toronto, or if you’ve watched them on S+L TV, you will definitely enjoy this book. If you’ve never heard of lectio divina and you’re hearing about Archbishop Thomas Collins for the first time, you are going to love his conversational approach. This book is full of great advice for reading Scriptures, but most importantly it is a great guide for anyone wishing to enhance their lectio divina experience. Those who thirst to draw closer to God’s Word will find refreshment in these pages. Pathway to our Hearts is published by Ave Maria Press and available in Canada through Joseph Inspirational and at Pauline Books and Media. If you are in the Toronto area and would like your own personal signed copy of the book, there will be another book signing at Pauline Books & Media, 3022 Dufferin St. (south of Lawrence), next Saturday, March 19, from 12:30-2:30pm.